Any Questions? We’re happy to answer all your questions – even the hard ones. So give us a call today, and get the information you need from one of our team members. If not, here is our official FAQ. 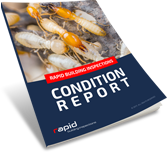 The report includes a building report, pest inspection report and a findings area. And all in easy-to-understand English. It means fast dispatch and a guarantee of not missing the appointment. You’ll have your report 24 hours after the inspection on your money back! Our RBI consultant will call to confirm the details of your property. We will dispatch the RBI inspector at your appointed time. Can I rescind my contract based on your findings? Our condition reports are in accordance with current Australian Standards and recognised by real estate agents and solicitors. Provided you have special conditions in your contract, the condition report is known as proof. Rapid also conducts Handover Inspections – so we will need to include this as one of our products – the costs of these are the same as our prices for our other inspections. Handover inspections are an independent inspection of a newly completed building/house that provides the client with the satisfaction that their new house has been built to a high standard or alternatively provides them with a list of defects that they can then go back to the builder with and request that the builder rectify these prior to settlement.